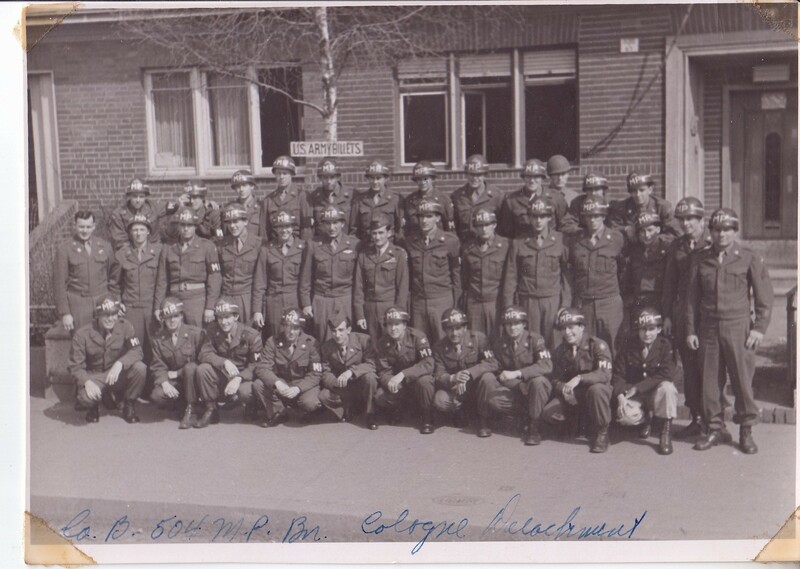 The first vignette Sgt. Peters discusses has to do with a woman spying for the Germans. On their way to the front lines a gray haired old woman approached their jeep and told the correspondents that a woman was giving signals to the Germans from her hotel window at night. The old woman told the correspondents that she had told officers but they didn’t do anything about it. A short time later a jeep full of MPs pulled up and the story was repeated. The jeep full of MPs and the correspondents then went to the hotel in question where they found three young women one of whom was “very undressed” according to Sgt. Peters. The hotel room was in fact what it appeared to be and the MPs told the women all they wanted was the one who flashed the light at night. At first all was denied until the MPs began to search the room. They found a flashlight of German origin and eventually the one doing all the denying was found to be the one giving signals. The MPs believed the girls were imported by the Germans from another area in France to “entertain” the troops and of the three only the one was a willing collaborator. 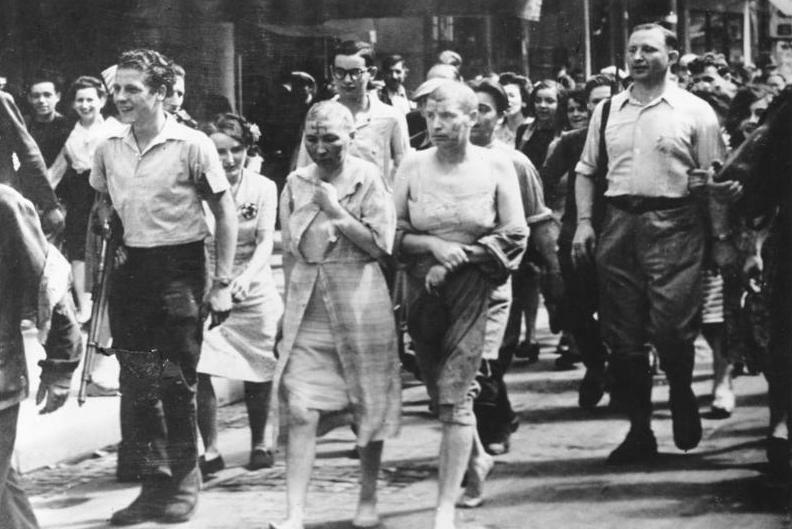 This well known picture shows women with their heads shaved by the French resistance. They were accused of sleeping with the Germans and were considered collaborators. They were shamed by having their heads shaved and swastikas painted on the their foreheads as well as paraded naked down French streets..
French civilians cheered the MPs as they exited with the three women. My dad was an MP stationed in occupied Germany 1945-46 and he told me once how they had to break up fights at houses of prostitution. He said the MPs were not concerned about the houses for that was a matter for the German police (who tolerated them because people were in a bad way) but were concerned about American troops beating the women and so forth. War is nasty business and people do what they must do to survive and these French women just like the German women from my dad’s duty station were just trying to survive. After they leave the village where the hotel is they are treated to a 9th Air Force bombing. They do not identify the bombers so they could be fighter bombers like P-47s or B-24 Liberators. During the Normandy campaign the Germans could hardly move at all during day light hours given the allied dominance of the air. The second vignette featured the jeep of correspondents driving through an area cleared of organized resistance but snipers still infesting the area. 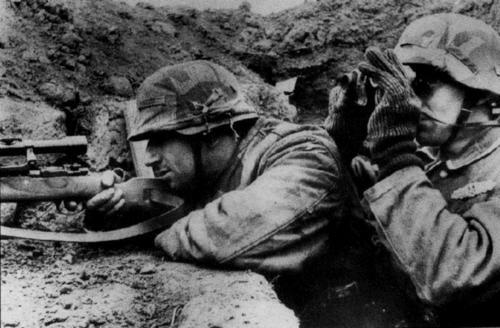 As they proceeded to the front they came across a mortar position that was shelling the Germans. 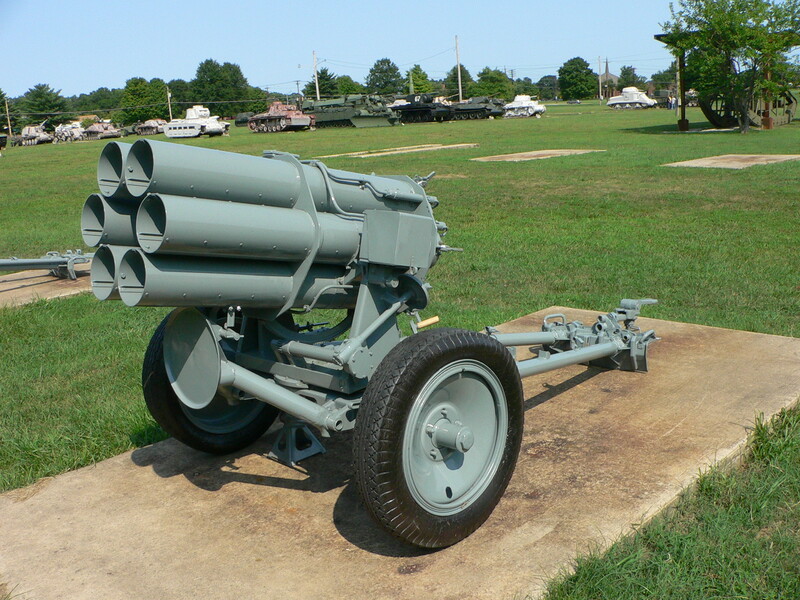 The Germans replied with “screaming meamies” the American nickname for a nebelwerfer, a multiple barreled rocket launcher that sounded as frightening as it was destructive. The next vignette has them arriving at another part of the front that is alive with German snipers and the medics are bringing in the wounded including a man with half his face blown off by a 20mm shell (probably from a flak gun deployed for ground use). Just as they are dealing with that shock another man runs up to the CO to tell him their lieutenant has just been hit in the arm and the bones are sticking out. The CO heads off in the direction of the platoon under fire. All the major combatants of WW2 used snipers. They were used in a number of roles but one was to slow down an advance. These two German Army snipers (one is a spotter) could have been on either front and are wearing camouflaged late war uniforms. The rifle is a 98k fitted with a sniper scope. The last vignette features the correspondents with a gung-ho but unnamed Colonel and his regiment penetrating into eastern Cherbourg. The correspondents are alongside a half-track as this famous Colonel speeds by in a jeep. Suddenly a 88mm opens up (A flak gun highly effective against armored ground targets as well as airplanes) and the half-track takes a hit. Presumably the shell goes through the thinly armored track because the Sgt. tells Preston they will have it ready to go to the following day! An American tractor dragging off a captured 88mm gun. 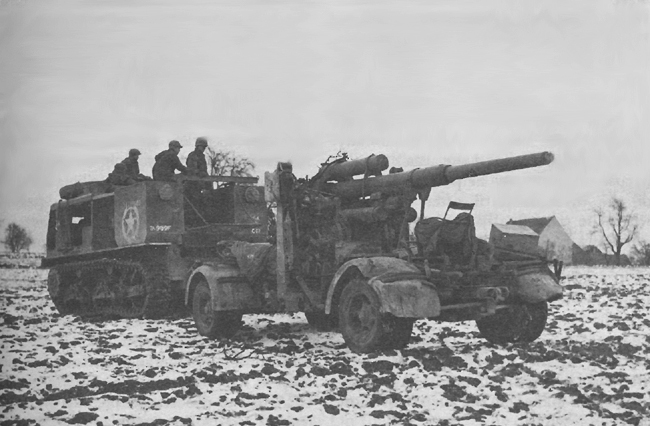 The 88mm dual purpose gun was one of the most feared weapons of WW2 because of its range and the destructive power of the high velocity cannon. Yank often published the names of individual GIs. Here are the ones listed in the article in the hopes that maybe a family member looks up the name on Google and finds out something they did not know! 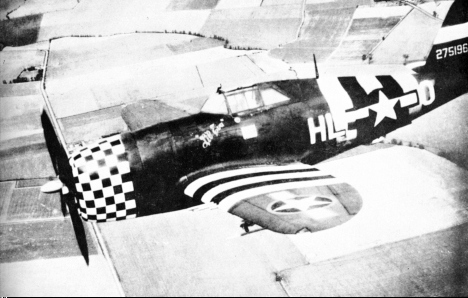 If the bombers were from the 9th Air Force, then they were either light (A20s), medium (B26s) or fighter (probably P47, maybe P38 or P51s) bombers. The heavies (B17s and B24s) plus their fighter escorts were in the 8th, whilst the 9th was responsible for tactical air support. By saying that the aircraft were from the 9th but not specifying the types, the author is probably giving credit to the correct unit, without risking giving too much information to the enemy. Martin, you are a fount of knowledge! I should have guessed about the B24s given they were heavies and probably employed elsewhere! I hope folks read your comments for you always add something good to my posts. Many thanks!